This example shows the model of a room thermostat that controls heating, cooling and a fan to maintain a user defined temperature. It uses regions to model the three parts of such a controller. 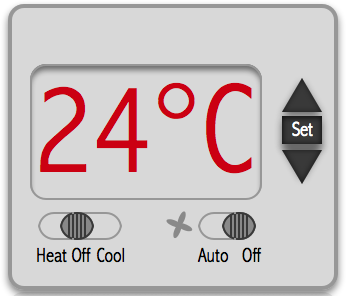 The user interface that allows to set the temperature for heating or cooling using the set, up and down key. The fan that is active in case furnace or air condition is on. The thermostat model is based on an example from Testcover.com. In state diagrams usually only one state is active at a time. 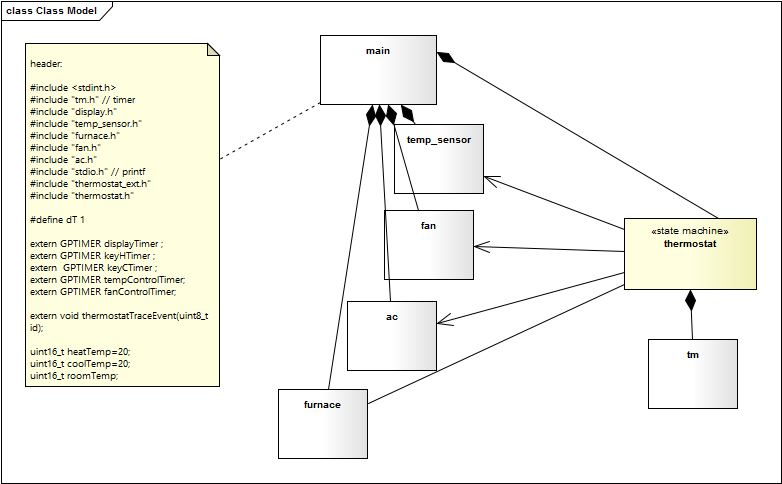 In UML state diagrams regions also allow to model concurrency - i.e. more than one state is active at a time (AND states). A UML state may be divided into regions. Each region contains sub-states. Regions are executed in parallel. You can think of regions as independent state machines displayed in one diagram. The state machine below (Fig. 1) shows three regions each running in parallel. Dashed lines are used to divide a state into regions. Class diagram. In the attached comment C-code can be defined that is just included into the generated state machine code. Regions react on the same set of events. Implementing all the functions in one state machine does not require to model two machines with the same set of events. Regions need access to the same internal variables or helper functions. In the thermostat case the first two regions need access to the user settings such as coolTemp, heatTemp and the current room temperature (roomTemp). Regions need to know the state of other regions. In the thermostat example the fan control region changes state based on the state of the heat control region. In fact it would be possible to model the three regions as individual machines, but due to their close interaction is makes sense to model them in one state diagram. The following state diagram in figure 2 shows the classes (i.e. C-files) involved in the solution. The thermostat is the central state machine. 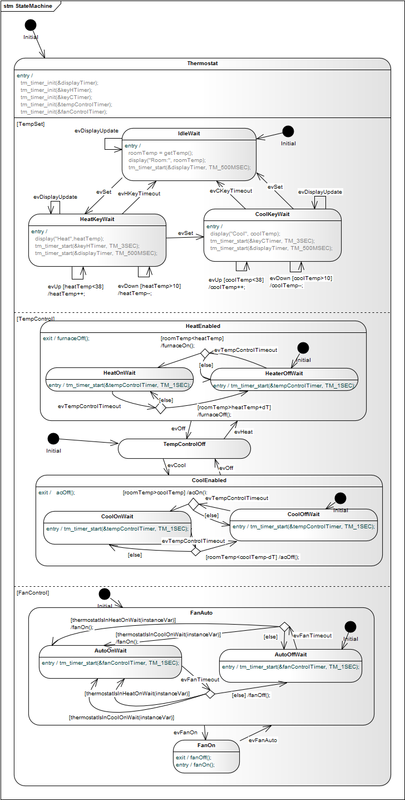 It is fully generated from the state machine diagram shown in figure one. For code generation only the yellow marked information is needed. All other classes are more or less documentation. The timer implementation is taken from a recent article published on Embedded.com. In main.c the keyboard is cyclically scanned and the user can send events to the machine (e.g. increment the room temperature). The following code shows an extract of the generated state machine code. In case you are interested in the full example running on various operating systems just send a request to info@sinelabore.com. /* Create a copy of the instance data. In this example we have shows how regions can be beneficially used for modeling parallel actions and how easy it is to generate code from the state diagram. The generated code can be adjusted to your needs and requires no additional run-time libraries. Very useful for my academic research.